In the middle of the night on Aug. 28, 2005, a pair of ruby slippers from the classic movie “The Wizard of Oz,” were stolen from the Judy Garland Museum in Grand Rapids, Minnesota. Twelve years later, the Federal Bureau of Investigation conducted a sting operation–location undisclosed–that captured a pair of size-five women’s high heels covered in faded red sequins. As is the case with many key props for major motion pictures, Metro-Goldwyn-Mayer’s costume department created at least seven pairs of Dorothy’s ruby slippers during the course of the movie’s filming. Only four are known to exist today. Replicas of the iconic slippers are rampant, and FBI investigators were not sure if the seized shoes were the long-lost pair. So in July, the FBI headed to the basement of Smithsonian Institution’s National Museum of American History to ask scientists to examine the pilfered pair of pumps. Conveniently, the Smithsonian was wrapping up a two-year conservation effort of their slippers, which had been funded by a 2016 Kickstarter campaign with more than 6,000 donors. The four known pairs of Dorothy’s slippers look nearly identical, but they have gone on divergent journeys. In 1940, a 16-year-old Roberta Bauman won one pair in a movie trivia contest. Now in private hands, the pair has not viewed publicly since 2000. The remaining trio went back into storage on the MGM lot. Studio executives did not immediately consider them to be valuable after the movie wrapped. None were seen again until 1970, when Hollywood costumer Kent Warner retrieved a pair for a memorabilia auction. Merla Banta, Fred Carr and Stephen Hinchliffe bought that pair and eventually donated them to the Smithsonian Institution in 1979. Lovingly called “America’s pair” by museum staff, those shoes have been on display nearly consistently ever since. The fate of the other two pairs has intrigued “Wizard of Oz” historians for years, said Ryan Lintelman, entertainment curator at the National Museum of American History. In 2012, benefactors led by actor Leonardo DeCaprio bought one of those final pairs at auction. Known by Oz fans as the “witch’s shoes,” these ruby slippers are in better condition than the others. Many experts believe this pair was used in close-up shots — like on the Wicked Witch of the East’s feet after she was crushed by Dorothy’s tornado-spun house. The Academy Museum of Motion Pictures in Los Angeles plans to exhibit them after its construction finishes in 2019. Memorabilia collector Michael Shaw bought the fourth known pair of ruby slippers from Warner in 1970 for $2,000, which were on display at the Judy Garland Museum — until they were snatched without so much as a fingerprint left behind. Only a single sequin remained. Will the real ruby slippers please stand up? An authentic pair of ruby slippers from the “Wizard of Oz” are now worth millions of dollars. But replicas are common due to the movie’s popularity, Lintelman said. Many hopeful owners turn to Smithsonian conservators hoping their shoes match the pair on display at the National Museum of American History. Most of the time, the conservators can tell with just a photograph that the replicas are not authentic. “We’ve had to break some hearts over the years unfortunately,” Lintelman said of the fakes. There are telltale signs. Sequins on replica shoes are often faceted rather than flat, for example. Or shoe company logos might be placed on cloth tags bought from eBay rather than embossed in leather. 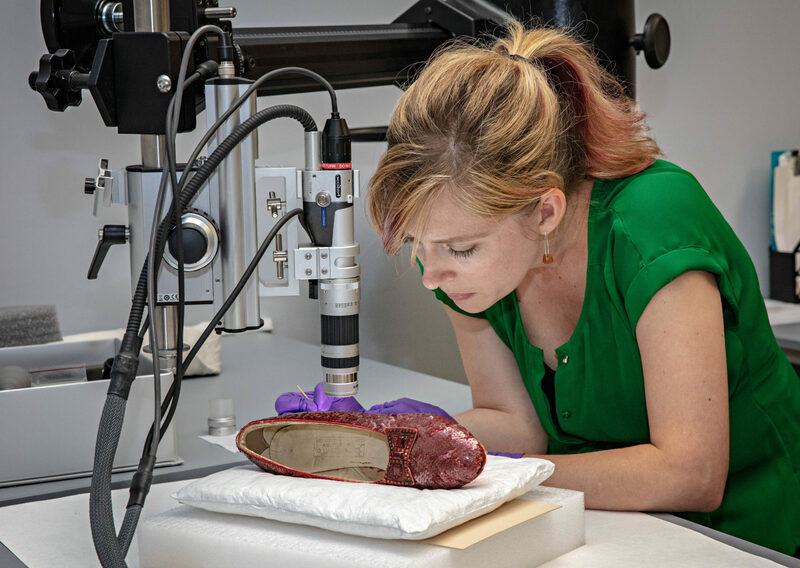 Over a year and a half, Smithsonian’s conservation team of 15 experts snapped more than 300 photographs and microscopic images of the museum’s shoes. They also employed nine analytical techniques — like polarized light microscopy and scanning electron microscopy — to identify their material composition. That wealth of data proved useful when the FBI arrived, said Dawn Wallace, an objects conservator at the National Museum of American History. Having spent more than 200 hours examining and cleaning the museum’s pair of heels, Wallace is one of the few people in the world qualified to compare ruby slippers. The FBI’s sequin-covered heels certainly looked the part to Wallace and her colleague Richard Barden, the museum’s preservation services manager, on first impression. Dividing the pair of shoes between two microscopes, the two conservators quickly confirmed the constructions were similar. “Within the first hour, we were pretty certain that yes, these are consistent with the shoes that we have,” Wallace said. Both sets were leather pumps manufactured by Innes Shoe Company. Both had been dyed red and overlaid with red mesh covered in hand-stitched sequins. Each set also had red paint on the bottom and pieces of orange-red felt glued to their soles — a prop design, the conservators believe, was used to muffle sound during dance sequences. Gwenaelle Kavich, a Smithsonian conservation scientist, joined the investigation. During the Kickstarter-funded effort, she was responsible for analyzing many of the fibers, fabrics and plastics embedded in the shoes. Her tool of choice was a handheld X-ray fluorescence machine that looks like a space-age blowdryer. The sequins on all four shoes contained a layer of silver to give them their shine. Modern sequins use aluminum. The team knows at what energy this happens for each element, so they can identify chemicals like copper, zinc or brass. Like the Smithsonian’s ruby slippers, the FBI’s recovered pair had brass in the prongs that held glass beads to the shoes’ bows. Red paint on both pairs contained cadmium, a cancer-causing element used in the 1930’s to provide a red tone, which has since been taken out of production. The sequins on all four shoes contained a layer of silver to give them their shine. Modern sequins use aluminum. 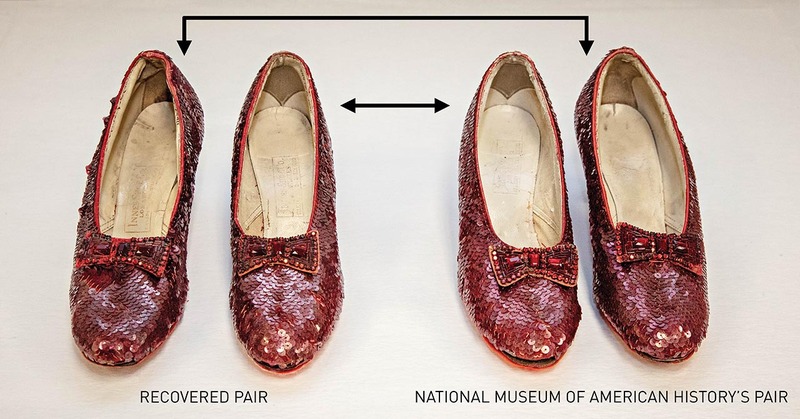 Wallace and Kavich also used Fourier Transform Infrared Spectroscopy — a technique that makes a structural fingerprint from an infrared scan — to determine the FBI’s slippers used a cotton fiber to attach sequins consistent with the museum’s pair. Wallace’s eureka moment came when she spotted red paint on some beads on the FBI’s slippers. The Smithsonian’s pair of shoes sport a collection of red glass beads — but a few are actually clear beads painted red to match. It was a common technique costumers used on movie sets at the time. Another poorly known fact: The Smithsonian’s ruby slippers are not identical shoes. Their sizes differ — 5C and 5BC — and experts believe the shoes come from two separate sets of high heels. The bows carry slightly contrasting shapes, the heel grips are distinct shapes and the insoles are made from different types of leather. The right shoe is inscribed with “#1 Judy Garland”, while “#6 Judy Garland” marks the left. Those labels helped track the individual pairs on set. The Academy’s pair, for example, are both labeled #7 Judy Garland. The scientists soon confirmed that the FBI’s slippers were reciprocal shoes of the Smithsonian’s — reuniting the original pairs for the first time since 1970. 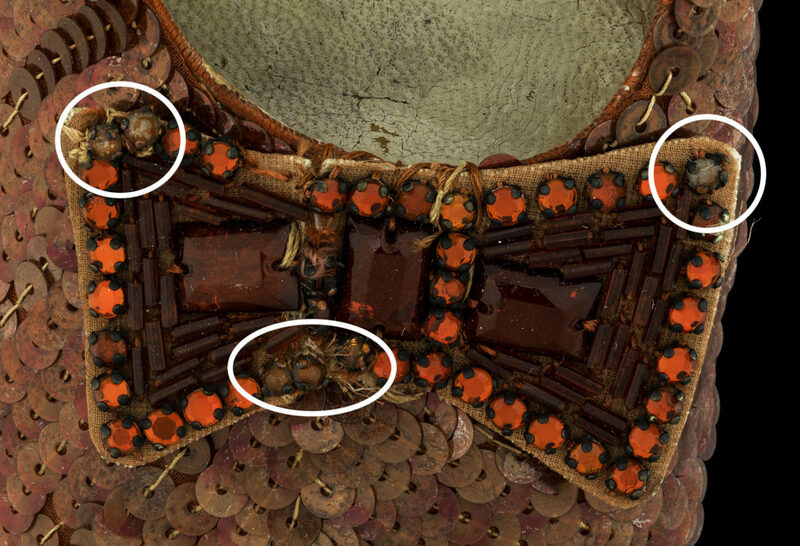 Even hexagonal, faceted beads only seen on the Smithsonian’s left shoe matched beads on the FBI’s right shoe. “To realize that we had the mismatched pairs together for the first time since that time was it was just a once in a lifetime moment,” curator Lintelman said. Wallace is now believed to be one of four people who have personally examined three of the four known pairs of ruby slippers. While the Smithsonian Institution does not officially authenticate objects, their examination provided enough evidence for the FBI. 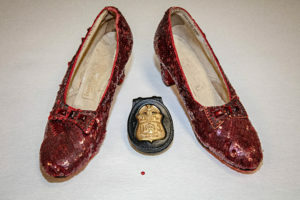 On Sept. 4, the bureau’s Minneapolis Division announced the recovery of the ruby slippers stolen from the Judy Garland museum in 2005. The recovered pair of ruby slippers remains in FBI custody pending the ongoing investigation. But for the Smithsonian’s ruby slippers, there’s no place like home. The pair went back on display at the National Museum of American History Friday in their own custom-made, environmentally controlled display case.